I’m on the second story of an abandoned building in Phnom Penh that was probably a decent hotel at one point. A man leads me through a dusty, rubbish-strewn corridor to a small room. Inside is a mosquito net, a haggard single mattress and a woman crouching over a small stove. She looks up at me but doesn’t smile. The man pulls a little bag of crystal meth from his pocket and gestures that we smoke it. I came to this area to photograph street art and I’m immediately roused to assess my safety. I quickly notice that the man’s pupils are dilated and he has a few small scabs around his lips. He’s neither pushy nor friendly about the drugs. I excuse myself and guardedly begin to descend the stairs. He follows without saying much, and then offers the drugs again. I’m not overly surprised to find a dilapidated drug den here. It’s no secret that drugs are widely available and fairly problematic in Cambodia. The most common substances are crystal methamphetamine (better known as “ice”) and a cheaper pill made from a mix of methamphetamine and caffeine, locally referred to as yaba. Apparently a dose of either can be bought for less than $5USD. I first came to Phnom Penh almost 10 years ago, back when this was the infamous “lake side” tourist district. Guesthouses, restaurants and shops were sprawled along the fringe of a 90-hectare lake. It was called Boeung Kak and it was a thriving and fun place to hang out, drink beers and watch the sunset. Now I’m walking quickly away from the man, out of the creepy building and into the sunlight. I wonder how this area came to be so ghostly, so dilapidated and so visibly drug affected. Later I learn that in 2007, the Cambodian government leased Boeung Kak and the surrounding land for $79 million to a company called Shukaku who had plans to redevelop the area. In 2008 Shakuku began filling the lake with sand, which initially flooded many of the surrounding houses and eventually destroyed the lake completely. Since then, it is estimated that 15,000 residents have been displaced from the area. 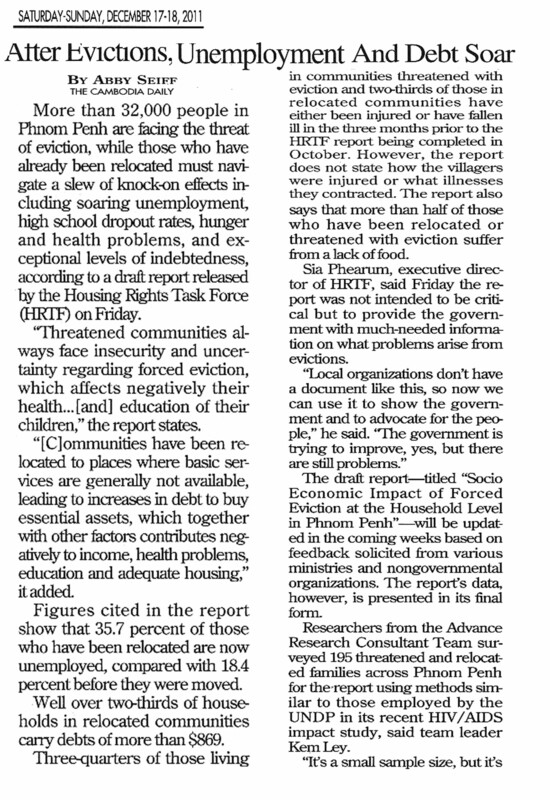 For those still in Boeung Kak, unemployment and debt pervade the community. Almost 10 years later, Shakuku’s development plans are still a work in progress. I walk across a vacant block of land and take photos of the huge, ghostly building from which I just escaped. A young boy—maybe five or six years old—approaches and then leads me toward a mural of a woman’s face. He points at the black-stencilled woman with thin red lines emanating from her cheeks. She’s crying big blue tears that flow upward and outward from her eyes. I start taking pictures but the boy tugs at my shirt and leads me down a narrow laneway toward another mural. I follow obediently. On the next wall is a large image of a young boy sitting cross-legged with his eyes closed. There’s a small fish next to his head, observing him. He looks a lot like the boy who has been showing me around. I take more pictures, then the boy leads me to another mural. I keep snapping away until, in my periphery, I hear a steal door creak open and slam shut. An enraged man storms past me and down another narrow laneway. He doesn’t make eye contact but his anger puts me on edge. I assume he’s part of the ice epidemic too. As of 2013, crystal meth and yaba were on the rise in Cambodia, according to a UN drug report. It’s a difficult issue because there isn’t much public support available to addicts in Cambodia. Foreign NGOs run most of the rehabilitation services but amphetamines are rampant and there isn’t much help available. The next mural is of a young masked figure, with his palm held out. There is a small house just above his outstretched hand. This one clarifies the common thread that links the art: displacement. Just as I’m figuring this out, I become aware of a man dressed in shorts and a heavy camouflage jacket standing behind me. He speaks great English and wants to tell me about the company that is developing Boeung Kak, the corrupt government official who owns it and how badly it has affected his family and neighbours. He sounds drug affected or sleep deprived or both. He talks morosely, and though I’m interested, I don’t know if I trust him. The young boy disappears, leaving me with him, and the man says he wants to show me his house. I follow him down a series of alleyways until they seem to be getting smaller and smaller. I start to feel a little more on edge with each turn. Around each corner more men appear and seem to be following us. Soon there are half a dozen of them around, none smiling, and I feel like I’m about to get robbed. I make up an excuse about finding the young boy and abruptly begin retreating toward the main road. The man tries to convince me otherwise, but he doesn’t insist that I stay. After turning two corners I break into a run. At the main road I find a man with a motorbike and ask him to drive me back to where the tourist area where I’m staying. He’s not a taxi driver but I’m relieved when he agrees and we speed away from the place. My fear dissipates with the hot breeze and is replaced with surprise. Life moves fast, as travelling constantly reminds us, but it feels like Phnom Penh’s lake-side went from thriving tourist hub to meth-addicted ghost town in the blink of an eye.